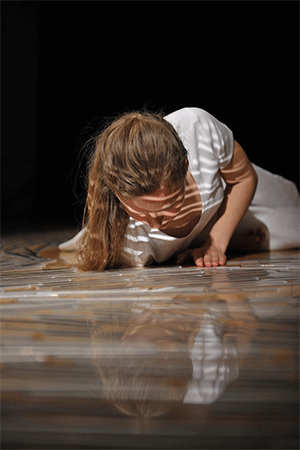 Lecturer in Dance Choreography Angela Woodhouse has revived her acclaimed work Sighted, as part of Collect 2015. Originally commissioned in 2009 by the Royal Opera House, Deloitte Ignite Festival and The Place Theatre, Sighted was performed at Saatchi Gallery in May as part of the Crafts Council's international art fair for contemporary objects. Angela collaborated with artist Caroline Broadhead and dancers Stine Nilsen and Martina Conti to create Sighted, which Time Out labelled 'Breathtaking' when it was originally performed at the Royal Opera House. The performance comprises two solos, each of which is performed simultaneously to different audiences in discreet, enclosed spaces that mirror each other in certain design and movement elements. "Caroline Broadhead and I feel privileged to show our work at Collect 2015," said Angela. "This is a prestigious event in the London arts calendar and, importantly, we are the first to be bringing performance work to Collect. "We are very grateful for the support of Middlesex University and Central Saint Martin's in re- mounting Sighted."